What are the Benefits of Having More Than One Child? 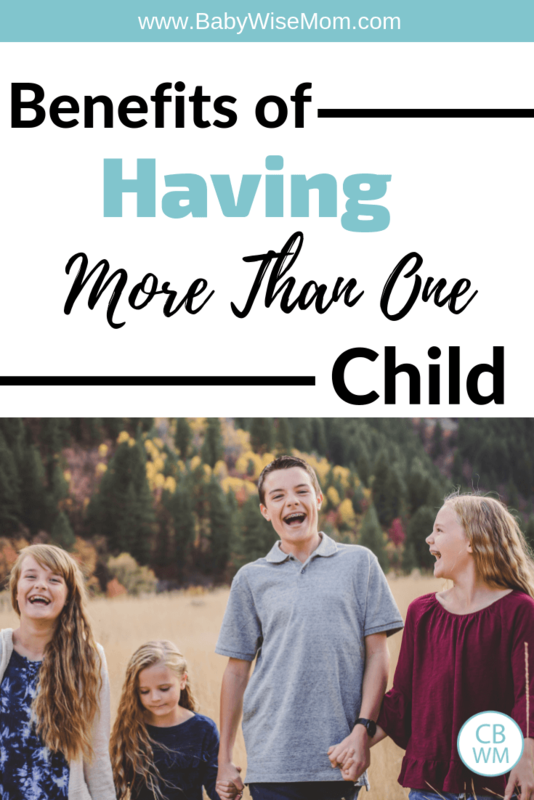 Should you have one child–an only child? Benefits of having a second baby. Many parents find themselves facing the question one day of whether or not to have more than one child. Why is it a good idea to have more than one child? Is it a good idea? I asked readers on Facebook why to have more than one kid. Here are their combined answers with my answers on the benefits of having more than one child. 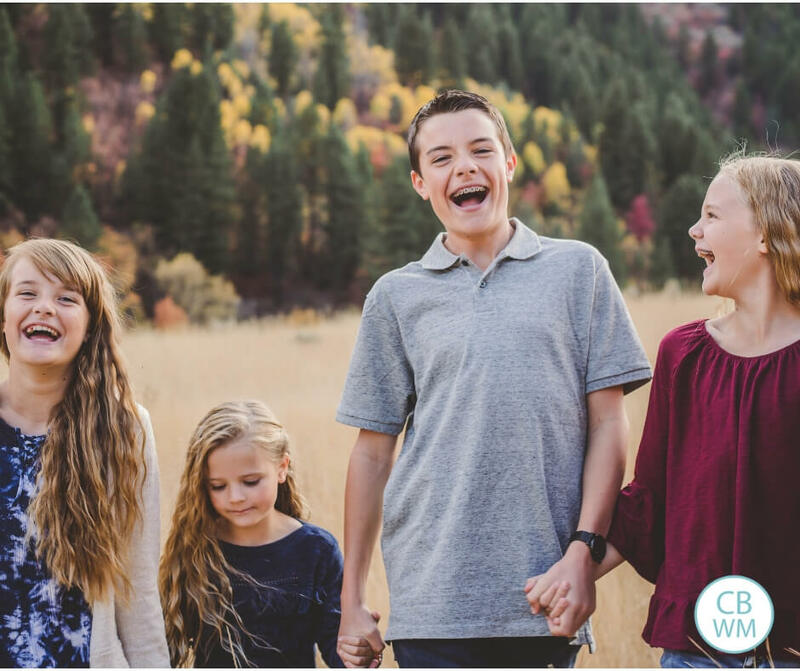 Multiple children can be a real blessing in many ways to the entire family. Here are some ways having more than one child benefits the family. Karen said: Once I experienced the JOY of having one child… I knew I would want another. And I just never imagined having only one child in my head. Maybe because my husband and I came from large families… The funny thing is, after the second, we really thought we were done… but now we have 4… and I LOVE IT so much. So thankful for my awesome kids! Neil said: Because every little girl needs a sister, and a father can never have too many daughters. They will teach you the fine points that you really need to know. Jess said: We had number two because our motto (and advice from trusted friends) has been “when you’re done, you’ll know”. They are 3 and 8 months I love how much they love each other already! I’m soaking it up for when they constant bickering starts 🙂 but I also look forward to the many character building moments that having siblings brings! I love to see my children hug each other or comfort each other. I love to hear about my sixth-grade daughter sticking up for her fourth-grade sister on the playground. These bonds are so valuable. 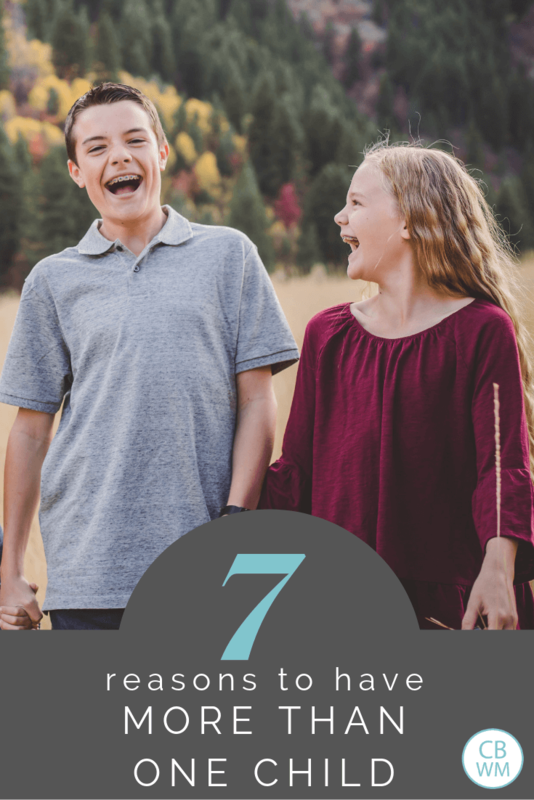 Help grow these through tips in my post Helping Siblings Like Each Other. Lissa said: I love the relationships the kids have with each other. I have 4, the baby was born 5 days before the oldest turned 6 so it’s all kinda crazy over here. But I love watching them learn to work together and see how they love each other. Don’t get me wrong I still play referee frequently but for the most part, they get along. It’s so fun to see how different they all are and getting to know their personalities. Natalie said: I’m an only child and always wanted a sibling, so I wanted my daughter to have one. I also really wanted a boy so we could have one of each. Luckily that worked out 😂 They are 5 and 18 months and at a really great spot where they can play together without wanting to kill each other, so I’m enjoying it while it lasts! Amanda said: I had 3 in 3 years, with #4 due in 4 weeks. Didn’t plan to have them that close, but I LOVE it! They play together really well and are all interested in mostly the same things. When a child has siblings, you are able to help them learn social skills that are harder to teach without those siblings. Children get more opportunities to learn how to share and to practice sharing. Children learn how to split up time, attention, and resources. Children are forced to think outside of themselves more often. This also doesn’t mean your only child can’t ever learn these skills. Intentional parenting can always help you achieve the goals you are seeking. With siblings, you just have an easier time and more opportunity to practice these skills supervised and regularly. The stigma around only children is that they are more spoiled and selfish than a child with siblings. This definitely happens without some focused parenting to prevent it. I love that my kids have constant friends with their siblings. On a Saturday, they have each other to do things with. When we go on vacation, they have buddies along with them. We can do family activities and be doing things with friends. I love that my children have each other as friends. This friend aspect can actually make life easier for you as a parent. The hardest times for me were having my oldest a toddler who didn’t have a playmate living at home yet and having a youngest as a preschooler whose playmates were all off at school for the day. You are not the only resource for fun at home when you have other children around. That benefit isn’t just in young years. There is a great benefit to having that friendship as adults to help each other navigate life and celebrate wins. When my husband and I are gone, my children will still have each other to turn to as family who loves them. They can also consult with each other on major life decisions. When your child has siblings, your child often has to wait for help with things. A two-year-old with a newborn sister often is required to wait for mommy’s help; rather than wait, he will often figure it out on his own. A mother with more than one child is much more likely to expect her children to take some independence and ownership of themselves rather than track all of the details of life. A child with a siblings needs to be more independent and responsible. Christina said: It wasn’t my decision really. 🙂 Baby #2 was definitely an unexpected surprise blessing for us since we were never able to get pregnant before that point. 🙂 I feel so much more complete with both kids. My son is his own unique person and has his own way of relating to us, just as my daughter is. It’s funny because the same things I love about one child, I love the opposite in the other child (ie. one is an extrovert, the other seems more introverted; one is more wild and energetic while the other is more calm and relaxed). In the end, family size is always a very personal manner. No one can tell you what is best for your individual family. Only you and your spouse can tell you that. Consider these benefits as you decide if you want to have another child or stick with one.